If you are alone this Valentine’s Day, as I will be (sob), February 14th can feel like a sick joke to make all of us feel bad. More and more of us are living alone: 41% of Camden households (where I live) in the last census were single householders (the 4th highest in England and Wales). Valentine’s Day creates such pressure and is often the crunch point for a relationship. If you are going to break it off, you will be weighing up whether to do it beforehand or afterwards. 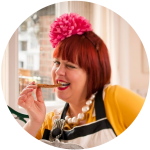 I once hosted an Anti-Valentine’s crepe party supper club. I put 30 tickets on sale, split evenly between the sexes. Only three men booked, and one of them had a girlfriend already. I couldn’t understand it: 18 gorgeous, young, slim, intelligent, funny, glamorous women- single! 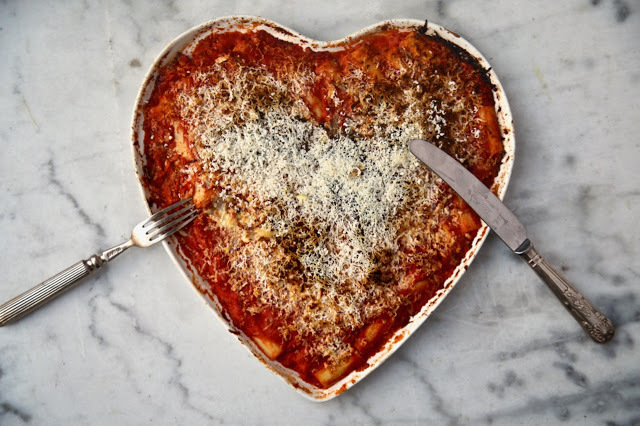 To hell with it all: make a romantic meal for yourself, or share one with a friend. 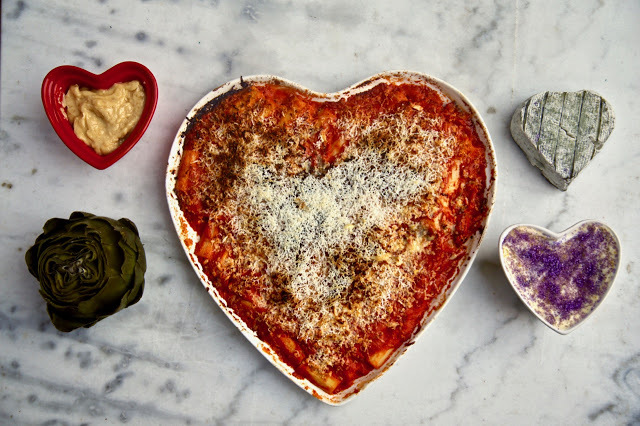 Here are a few ideas for easy V-Day recipes. This four-course dinner should take you at most a couple of hours to make. Start with the possets and, while they are chilling, steam the artichokes, then make the sauce for the gratin and the mayonnaise. 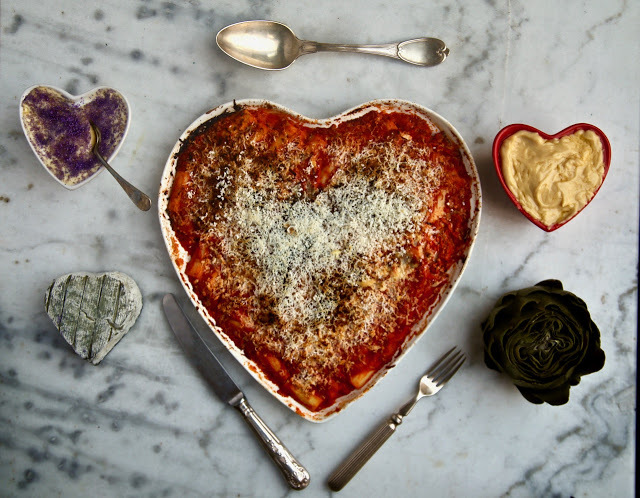 Buying heart-shaped dishes isn’t necessary, but when they cost only a couple of quid from Tiger or a local pound shop, you may as well indulge. Boil a large pot of water with lid, enough to cover the artichokes. 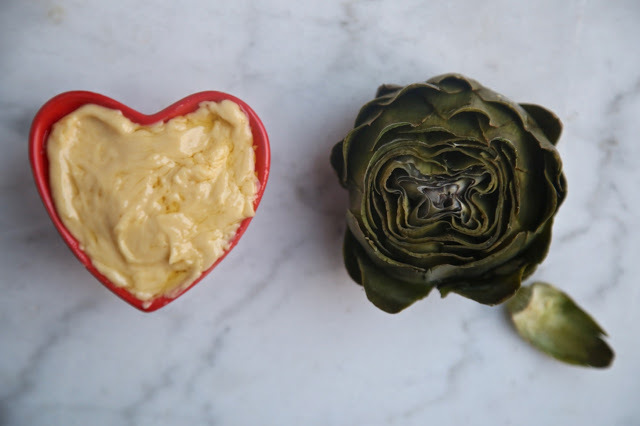 Cut off the stems and also, if you wish, the top inch from the artichoke so that there are no spikes. Place the artichokes in the boiling water with the salt and lemon, put on the lid and boil until a leaf out pulls easily (about 20 minutes). Put the egg yolk and mustard in a bowl and whisk. Slowly add the oil little by little, whisking all the time then add the salt. I love these delicate ivory tubes which you can only buy tinned in this country. If you don’t like hearts of palm, you can replace them with potato gnocchi. Preheat the oven to 200C. Put the olive oil and butter in a thick-bottomed saucepan and heat slowly. Add the tin of tomatoes, garlic, bay leaves and sea salt. Simmer for 15 minutes, then add the cream. Stir and remove the bay leaves. Pour a little of the sauce into the chosen oven dish (I’ve used an oven-safe ceramic heart by Sophie Conran) and place the hearts of palm all over the dish in one layer. Pour the rest of the sauce over the hearts of palm. Finely grate the cheese over the top and bake in the oven for 20 minutes. Remove and serve. This is about as easy a dessert as it’s possible to make. Literally a child could make it. The bergamot citrus gives it an exotic Earl Grey flavour, but you can also use ordinary lemons. The violet sugar is available from souschef.co.uk, one of my favourite online ingredient emporiums. Pour the cream and the sugar into a saucepan and heat gently until the sugar is melted. Remove from the heat and let it cool. Add the zest and juice from the bergamot or other citrus fruit, stirring it in. 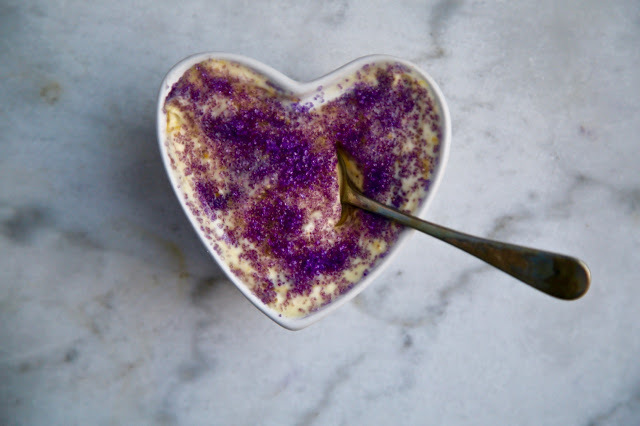 Pour it into a ramekin or heart-shaped dish. Chill in the fridge for a couple of hours. Sprinkle the violet sugar over the top. Serve. 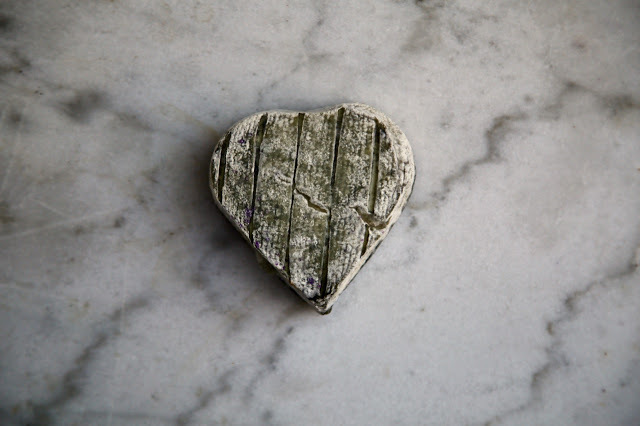 To add to the Valentine’s atmosphere, there are several cheeses that come in the shape of a heart, most famously the camembert-like Neufchatel. I used an ash-covered goats’ cheese heart. Serve with biscuits and quince jelly. Dress code: checked lumberjack shirts, furry trappers hats.